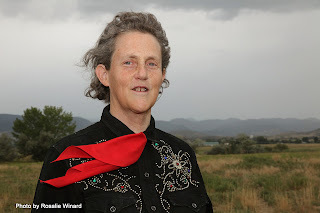 A professor of Animal Science at the Colorado State University, Dr. Temple Grandin is considered one of the most accomplished and well-known adults with autism in the world. Diagnosed with autism in 1950, she faced educational, social and professional roadblocks head on and turned her unique talents into a successful career as an author, lecturer and pioneering advocate for autism spectrum disorder education and into revolutionary work in the cattle industry. Dr. Grandin tells her story of "groping her way from the far side of darkness" in her book “Emergence: Labelled Autistic”, a book which stunned the world because, until its publication, many assumed that autism was a hindrance to achievement and to productivity in life. A 2010 made-for-television film about her life starred Claire Danes and won critical acclaim from award-giving bodies. Dr. Grandin was featured in major television programs all over the world, and has also been published in many journals. She has been honored as one of Time’s 100 most influential people. Diagnosed with "atypical development and strong autistic tendencies" and "too sick" for outpatient treatment, Stephen Shore was once recommended for institutionalization. As a child, he was non-verbal until he was four years old. With support from his parents, teachers, and family members, Dr. Shore is now a professor at Adelphi University, where his research focuses on matching best practice to the needs of people with autism. He is the President Emeritus of the Asperger’s Association of New England, and a former board member of the Autism Society. He now serves in the Inter-Agency Autism Coordinating Committee, the Asperger’s Syndrome and High Functioning Autism Association, the United States Autism and Asperger’s Alliance, and other autism related organizations. Only a few days to go. Hurry! Register now for the conference! Click here. Email us at aspnc2012@gmail.com or call us at (02) 926-6941 or (02) 929-8447 for more information.